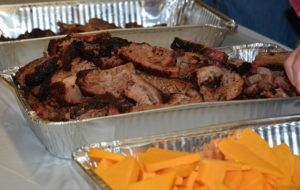 COLLEGE STATION – Texas barbecue is famous for beef brisket and as a bonus for barbecue fans, it has many healthful traits, said Dr. Stephen Smith, Texas A&M AgriLife Research scientist. Ground beef produced from the brisket contains high levels of oleic acid, which increases levels of HDL or good cholesterol in humans, Smith told beef producers at the recent 62nd Texas A&M Beef Cattle Short Course held at Texas A&M University in College Station. That’s good news as the popularity of Texas barbecue as well as overall ground beef consumption continues to increase annually. “Brisket has higher oleic acid than the flank or plate, which are the trims typically used to produce ground beef,” he said. “The fat in brisket also has a low melting point, that’s why the brisket is so juicy. That’s also why we like it so much here in Texas, and it’s by far the most popular choice for Texas barbecue. A series of studies summarizing Smith’s work will soon be submitted to the National Cattlemen’s Beef Association. It encompasses research looking at ground beef intake and plasma risk factors for cardiovascular disease and type II diabetes in men and women. Recently, he co-authored a research article on marbling for the association, available at http://bit.ly/1EwH8x6. “The primary goal of my research program is to evaluate methods to increase the marbling and healthfulness of beef,” Smith said. “My universe evolves around oleic acid. It’s the most abundant fatty acid in beef. It’s also most abundant in canola oil and olive oil. When cattle are fed high-concentrated diets for a long period, the meat becomes high in oleic acid and other monounsaturated fats. Smith said Wagyu beef is known for its high marbling and monounsaturated fat. They produce a highly marbled product and the more marbling, the healthier its fat composition, Smith said. In studies conducted at Texas A&M, Smith said results have shown that good cholesterol, HDL, always increases in men and women fed ground beef high in oleic acid, such as grain-fed beef from Angus, Wagyu or Akaushi cattle. In the tests conducted at Texas A&M, Smith said participants consumed five beef patties a week for five or six weeks.